The square cushion has woollen hand made folk fabric from Lowicz Region: a multi-stripe pattern in several colours on both sides. The accessory will make a fine addition to your sofa in the living area or on your bed for a subtle addition of designer style and colour to the scheme. Materials: cover 100% wool, inlet 100% cotton. Washing: hand and machine washable, in water below 30°C, just using a special detergent for wool or a delicate soap. Striped colorful hand made woolen fabric cover, red woolen top, bottom and piping. Filled with pure lamb's wool. 100% eco. Striped colorful hand woven woolen regional Polish fabric cover, green woolen top, bottom and piping. Striped colorful hand made woolen fabric cover, grey woolen bottom and piping. Filled with pure lamb's wool. 100% eco. The rectangular cushion has woollen hand made fabric inspired by Polish folk from Lowicz Region: a multi-stripe pattern in several colours on one side, and red-orange cotton velvet on the other side. The rectangular cushion has woollen hand made folk fabric from Lowicz Region: a multi-stripe pattern in several colours on one side, and red cotton velvet on the other side. The square cushion has woollen hand made fabric inspired by Polish folk: a multi-stripe pattern in several colours on one side, and red cotton velvet on the other side. 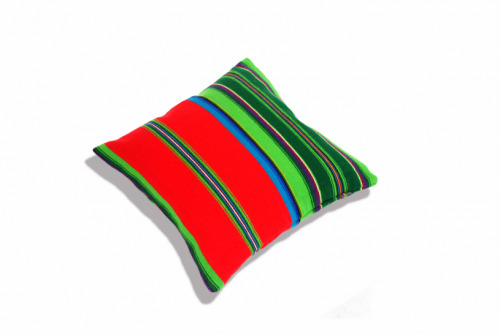 Small pillow has hand woven fabric from Lowicz Region: a multicolor stripes woolen fabric on both sides. Materials: cover 100% wool, velvet 100% cotton, inlet 100% cotton. Washing: hand and machine washable, in water below 30°C, use a detergent for wool or a delicate soap. Small square cushion has woollen hand made folk fabric from Lowicz Region: a multi-stripe pattern in several colours on both sides.